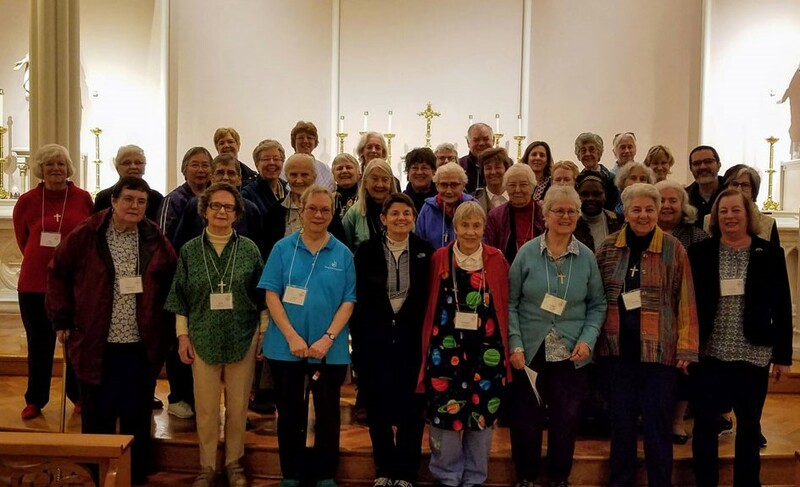 The Academy of the Sacred Heart recently welcomed 35 members of the Religious of the Sacred Heart (RSCJ) and its Associates for their annual Quad Area meeting, which is an extended time for prayer and the sharing of ministries among the group. This year, special presentations were made by Sr. Carlota Duarte, RSCJ, Sr. Hilda Binwame, RSCJ, and Sr. Marianna Torrano, RSCJ. Sr. Duarte spoke on her ministry with Chiapus Photography Project, which provides indigenous Maya peoples in Chiapus, Mexico, opportunities for cultural and artistic opportunities. Sr. Binwame spoke on her ministry in Ugandan schools, expressing her gratitude for the support of the Rosary in school ministry in Uganda. She taught everyone a few songs and dance moves as well! Sr. Torrano spoke on her ministry among the Native Americans at the St. Jude's Mission School on the Soboba Indian Reservation, which she helped to found as a response to extreme poverty. It was a beautiful weekend.